Beware HybridReserve is a Non-Regulated broker. It is NOT SAFE to trade. Is HybridReserve a scam or legit broker? No, it is not safe to trade with HybridReserve. HybridReserve is own by SingleBell OU which is an offshore company registered in St. Vincent and the Grenadines. St. Vincent and the Grenadines is notorious for its practically absent requirements and regulations. Due to the setup cost is low and it does not regulate forex trading. Therefore, it became an offshore zone for shady forex brokers such as CapitalXP, Welkron and more. You can read our detailed article about the risk of trading with brokers from St. Vincent and the Grenadines. The HybridReserve broker offers a trading solution for the traders of different size including professionals, private or institutional traders, while the software package delivers efficiently and profitably. The broker claims to be incorporated in tallin, Estonia. Apart from the fact that St. Vincent and the Grenadines is a very liberal jurisdiction, which not overseeing the financial investment firms and their activity, the office in Estonia is not registered as well. That means that the broker is actually is an illegal entity. 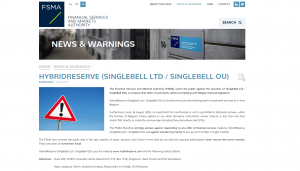 “The Financial Services and Markets Authority (FSMA) warns the public against the activities of (Singlebell Ltd / SingleBell OU), a company that offers investments without complying with Belgian financial legislation. HybridReserve (Singlebell Ltd / SingleBell OU) is not allowed to provide banking and/or investment services in or from Belgium.” FSMA, 19 February, 2019. “SingleBell Ltd. is not entitled to carry out banking transactions in Austria that require a licence. The provider is therefore not permitted to trade in financial futures contracts (futures) on its own account or on the account of others” FMA, 1 March, 2019. We advise all investors and traders avoid HybridReserve and other brokers from St. Vincent and the Grenadines. Traders should trade with well-regulated brokers such as UK brokers or brokers in Australia and reliable brokers such as XM.com and Plus500.